It was somewhere between tacos and dumplings, or maybe between coffee and burgers, that we realized Auckland is more than just an amazing city. Auckland is an amazing food city. Although our trips are typically motivated by history and sightseeing, food more often than not plays a major role in our activities. Food can do a better job of telling the story of a city’s people and culture than almost any building, monument, or exhibit. Through food tours we have learned about history and traditions in cities like Krakow, Ljubljana, Singapore, Buenos Aires, Dublin, and Kuala Lumpur. Our own research—and sometimes simple luck—has introduced us to memorable meals and gastronomical surprises in every city we have visited. Tasting our way through Auckland was no different; New Zealand’s capital city offers tasty treats around just about every corner. 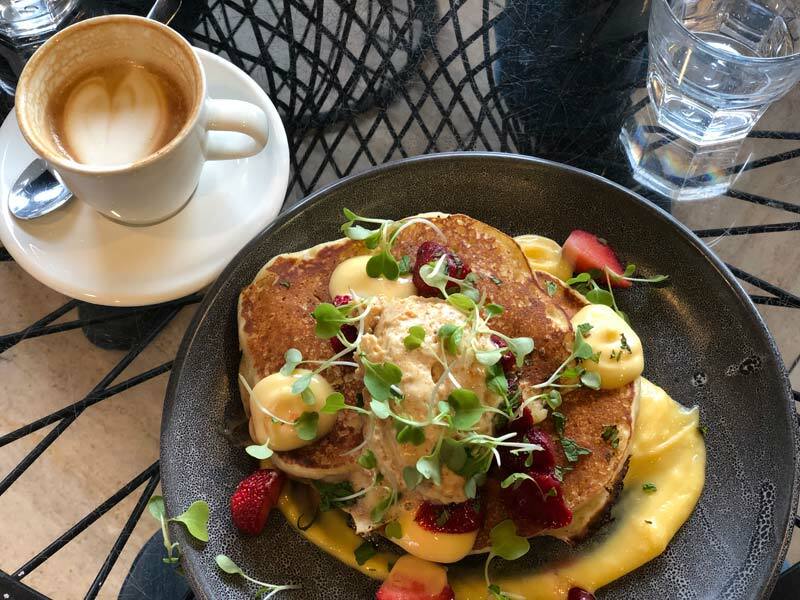 If you are planning a trip to Auckland, here are some of the highlights we discovered while enjoying some of the best of Auckland’s food scene. 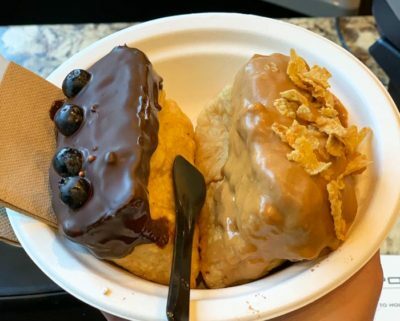 Take an Auckland Food Tour or Snack Solo? 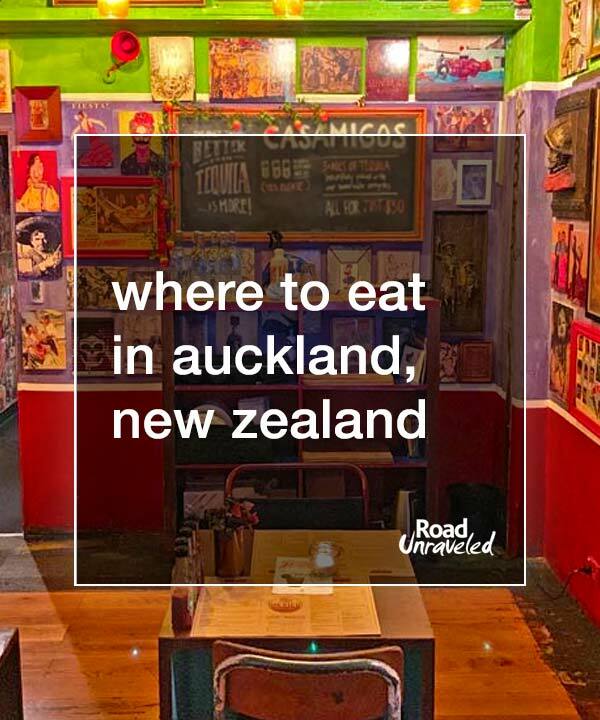 While finding a great meal in Auckland isn’t hard to do, there are two primary ways to whet your appetite: take an Auckland food tour or select a few spots on your own. You will undoubtedly have no trouble finding plenty of delicious meals, but make every effort to include an Auckland food tour on your itinerary! We were caught in a rain storm, but that wouldn’t put a damper on our day! We are big fans of food tours, and we work them into almost every trip we take. The opportunity to connect with a local guide who knows where to find the best meals made with local ingredients is an excellent way to start any visit to a new city. Although our schedule prevented us from taking an Auckland food tour when we arrived, we decided to book a walking tour on our final morning in the city—and it was the perfect way to wrap up our unforgettable time in New Zealand. We booked our Auckland food tour with The Big Foody, and we knew from the second we met Elle—who founded the company in 2011—that we were in for a delicious outing. Although our walking tour centered around busy Queen Street, a main road we traversed several times before meeting Elle, she took us into shops we would never have found without local guidance. 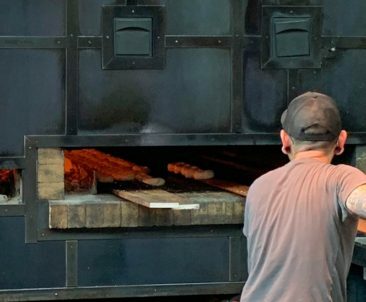 It’s easy to overlook tiny shops with just a few seats in favor of bigger, busier restaurants with expansive menus, but Elle expertly connected us not just to mouthwatering treats but to their stories and importance to the neighborhood. We learned about the people who owned the shops and why they specialized in certain types of cuisine. Instead of committing to a single meal, we sampled bites (big bites!) of a dozen different foods that represent the Auckland food scene. We especially loved spending our morning with Elle, who felt much more like a long-lost friend than a tour guide by the time we parted ways when the tour was over. 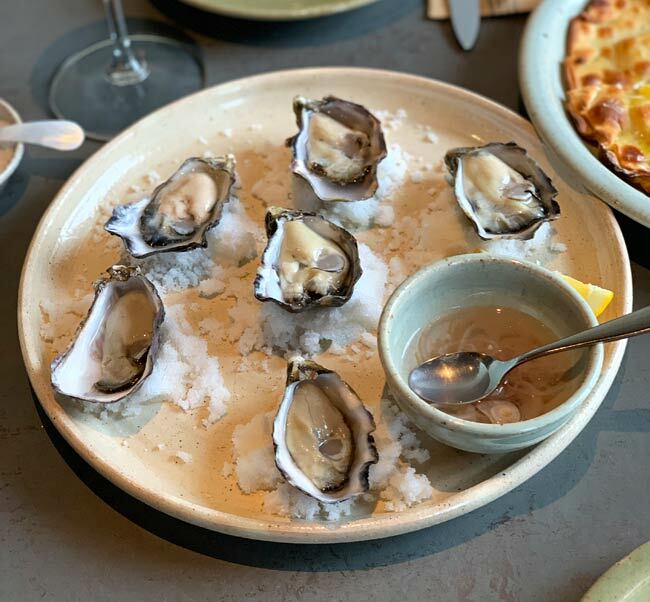 We had so many wonderful experiences in Auckland, but our Auckland food tour with Elle and The Big Foody really stood out as an experience we can’t wait to repeat. When we tried to define Auckland food, we struggled to do it. 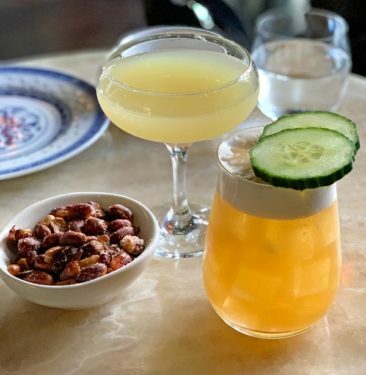 Browsing menus, we found a little bit of everything—Asian, Mexican, Italian, and even USA’s Southern cuisine make its way into restaurants throughout the city. We asked Elle about her thoughts on what characterizes Auckland food, and she suggested it’s less about specific ingredients than it is about quality. Auckland food reflects quality. It incorporates fresh ingredients to produce meals that rival those you would find in their cities of origin. We reflected on how the Southern fried chicken we had on our first night in town was just as good as what we eat when we are at home, and the pasta we had at another location was equally as delicious as what we enjoyed in Tuscany. We found the Auckland food scene to be innovative, risk-taking, and uncompromising. Everything we ate was fresh and delicious. We could taste the quality in every bite. If you haven’t considered Auckland, New Zealand as a world-class food city, now is the time to make that connection—and book your flight! Here are some of the restaurants we loved when exploring the Auckland food scene- in no particular order! 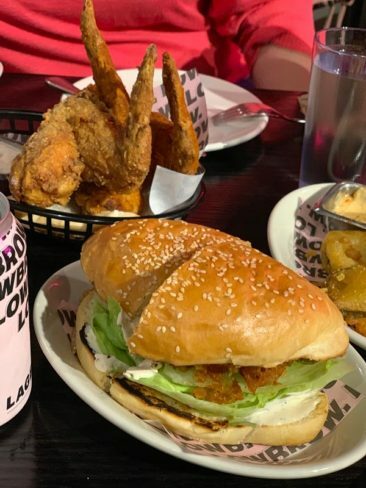 Our home in Virginia puts us within a short drive of delectable chicken and waffles whenever the craving strikes, but the Southern cuisine served at Auckland’s Orleans gives ours a run for its money. We visited Orleans just after landing in Auckland, selecting it because it was a short walk from our hotel and because a taste of home sounded good on what became a cold, drizzly evening. Orleans proves the Auckland food scene is broad enough to include USA staples like po’boys, mac ‘n cheese, and expertly prepared chicken and waffles. 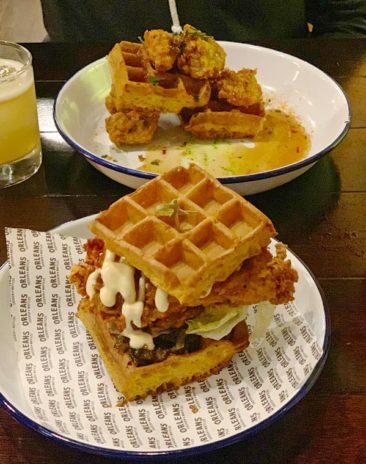 The chicken was crispy and flavorful, and with a light, fluffy waffle it was exactly the dinner we needed but didn’t expect to find so far from home. 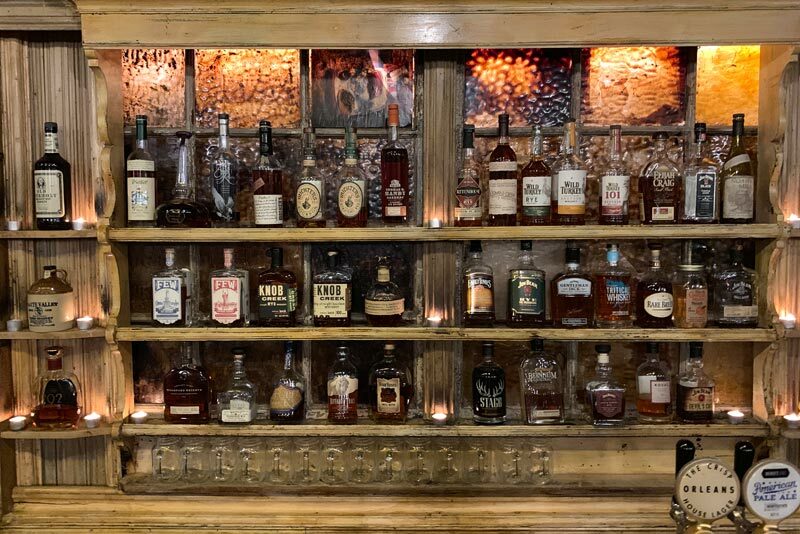 Even the bourbon selection was authentic; we noticed a few bourbons we tried during our visit to Kentucky’s Bourbon Trail. You may not expect Auckland food to include Southern classics, and we are certainly fans of iconic American food, but Orleans serves excellent meals that will make you feel like you were transported to a kitchen halfway around the world. 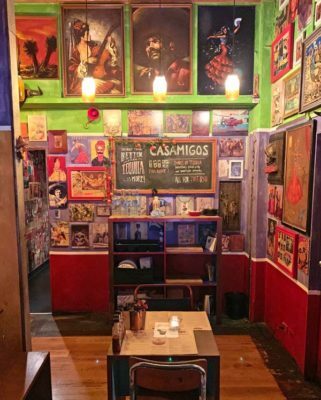 A desire for margaritas took us from the streets of Britomart and into Mexico, a gourmet tribute to one of our favorite cuisines. 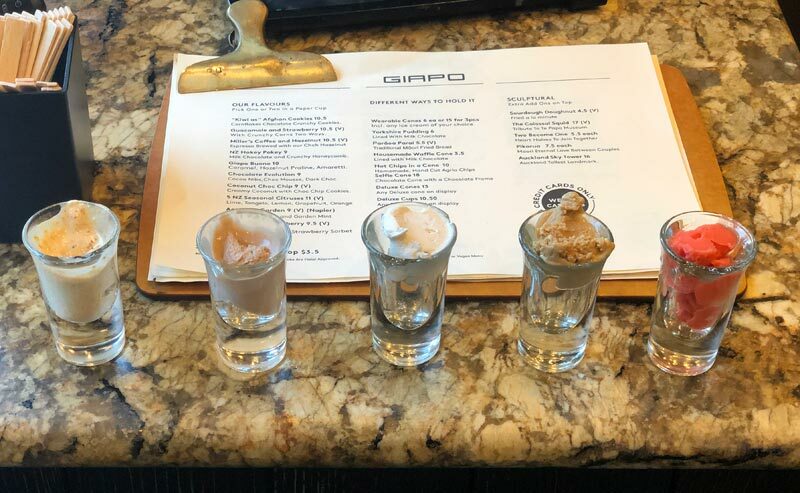 After settling in with a round of drinks, a tough selection from a long list of tasty flavor combinations (I chose pineapple cracked pepper), we ordered a few small plates to share. The Mexican fried chicken is outstanding: spicy, crispy, and enhanced with some tasty dipping sauces, we didn’t leave a crumb behind. The ceviche was fresh and reminiscent of the same dish I loved when we visited Panama, and we couldn’t say no to sweet, crunchy churros to complete our meal. We weren’t expecting to find great Mexican food during our trip to New Zealand, but Mexico—and Auckland food—surprised us again! 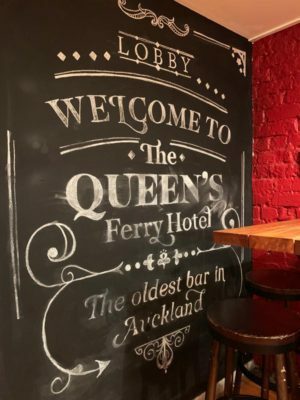 Just as amazing as the food, though, was the staff; our server Melina could not have been more fantastic, and she made sure to send us off with a list of her favorite spots to visit in Auckland. Our meal was wonderful, but Melina made our experience even more fun! Each time we mentioned we were planning to have dinner at Amano, the reaction was the same: prepare for a fantastic meal. That was exactly what we got when we finally sat down at Amano, where every table was full, and the food was just as delicious as expected. We started with Te Matuku Bay Pacific oysters, a choice that seemed as reflective of Auckland food as I could find, and the oysters were fresh and briny (and, yes, as tasty as the Virginia oysters we had a few weeks earlier). We each selected a pasta dish—pipe rigate for Adam, and chitarra for me. The pipe rigate is a classic dish served with local tomatoes and cheese, and the chitarra is scampi—the shrimp come right from the islands near Auckland. Paired with a couple of glasses of New Zealand wine, it was certainly one of the best meals we had in the city and a great representation of how Italian cuisine has a home within the Auckland food scene. Before leaving for a wine tasting tour on Waiheke Island, we needed to find a carb-based breakfast. We walked from our hotel to Best Ugly Bagels, which was packed on a Sunday morning as locals enjoyed breakfast at a series of communal tables just outside its entrance. Our Montreal-style bagels were definitely worth the short wait. Adam picked the Boss Hog, which topped a bagel with bacon, egg, and cheese. 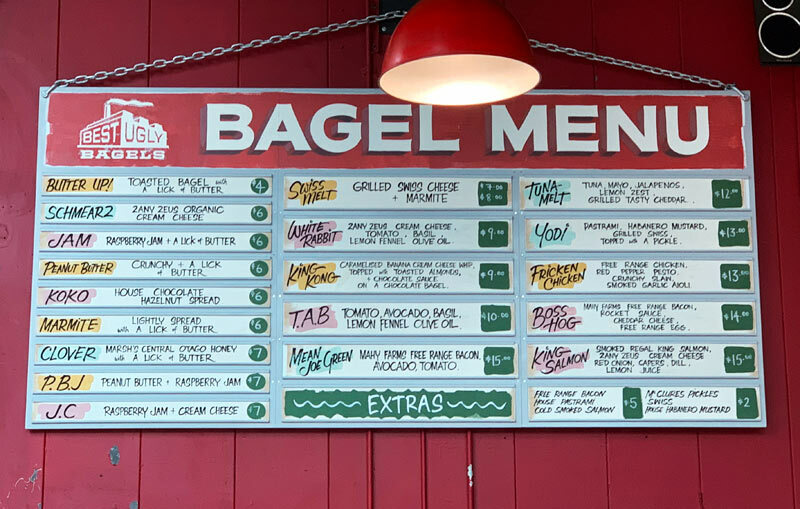 I took a cue from the person who ordered before us and selected the open-faced Mean Joe Green; bacon, avocado, and tomatoes made it a perfect bagel meal to start my day. Best Ugly Bagels serves a little bit of everything, from basic bagels with butter or cream cheese to bagels with sweet or savory toppings. 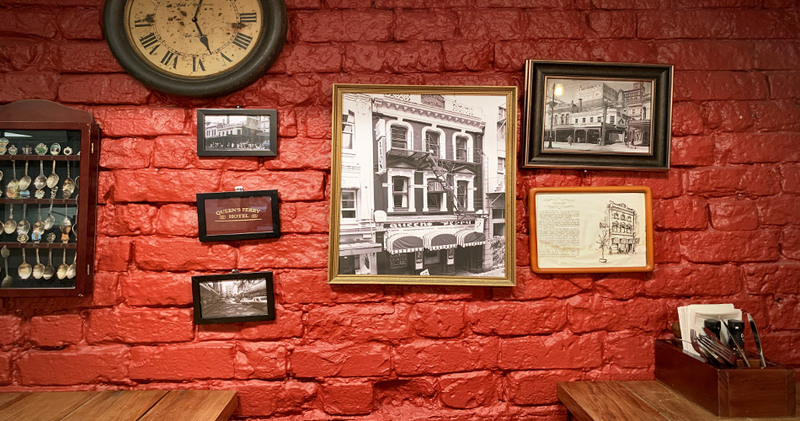 It’s a great place for a tasty, casual meal and you’ll find multiple locations around Auckland. We stopped into Xuxu for dumplings and cocktails, the kickoff to an evening of restaurant-hopping as we explored the Auckland food scene. Xuxu was quiet when we arrived, but within 20 minutes every table was crowded with people and bamboo steamers full of plump dumplings. 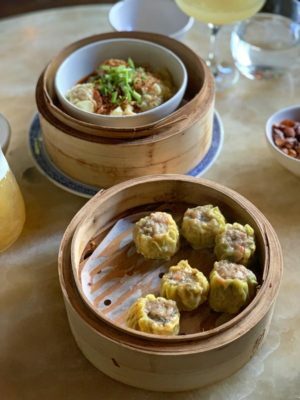 We chose two orders of dumplings—one with chicken, one with pork—and we had to talk ourselves out of ordering more (the first rule of the DIY Auckland food tour: don’t fill up at the first stop!). The cocktails were well-crafted as well; I was particularly impressed with the spicy Xuxu martini, the base of which is chili-infused Tanqueray. The rest of the happy hour crowd seemed as happy with their dumplings and cocktails as we were. 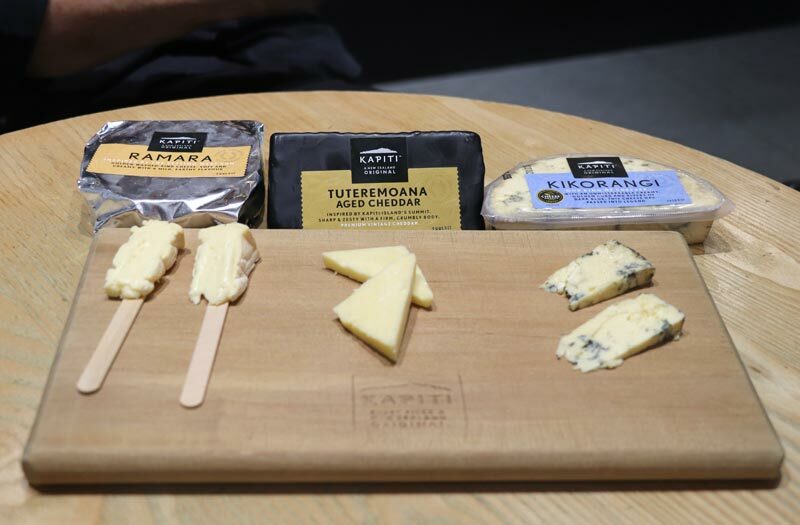 One of my favorite snacks is a simple plate of crackers and cheese, so when our Auckland food adventure took us to The Kapiti Store I knew we were in for a special treat. 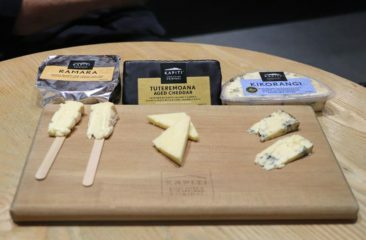 The Kapiti Store has been making and selling high-quality cheese for more than 30 years, and we sampled three different cheeses during our stop. The creamy Kikorangi blue cheese was my favorite; it’s a triple cream cheese with a buttery texture that melts in your mouth. We also loved the Tuteremoana cheddar, which is aged for three years and is sharp and almost a bit crunchy from lactate crystallization, a characteristic I have come to love in a good, aged cheese. Delicious on its own, Kapiti treated us to an incredible grilled cheese sandwich made with the Tuteremoana cheddar and their own freshly baked sourdough bread; to date, it is the best grilled cheese I have ever eaten. Fried chicken is a beloved staple in the USA, but some of the crunchiest, juiciest fried chicken in the world is served in Auckland. After getting caught in the rain (which happens a lot in Auckland!) we dried out over spicy chicken wings and fish sandwiches—and a couple of beers. The chicken was succulent, as was the fish; our meals were flavorful yet simple, allowing the food itself to really shine. 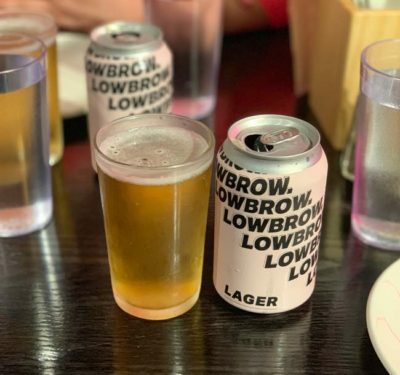 Lowbrow is committed to serving delicious food in a relaxed space, and we loved every bite—although after filling up on so much tasty Auckland food, we wished we had space for just a few more! While wandering through Auckland’s viaduct, we stopped into Gourmet Burger & Brew Kitchen for dinner. Hungry for a burger and onion rings, we found exactly what we were looking for—plus a round of cold beers. 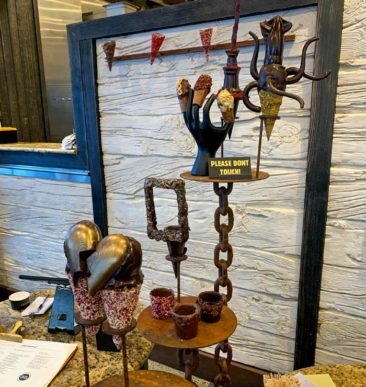 In addition to more traditional selections, the menu includes a couple of unique choices such as ostrich, kangaroo, and wild pork. We stayed closer to the familiar, choosing cheeseburgers (the Hawaiian burger for Adam, the Blue Vein burger for me), and we both enjoyed our meals. Gourmet Burger & Brew Kitchen is worth a visit, especially if you are near the Viaduct and looking for a great burger. More than a simple restaurant, Scarecrow is part eatery, part market, and part florist. 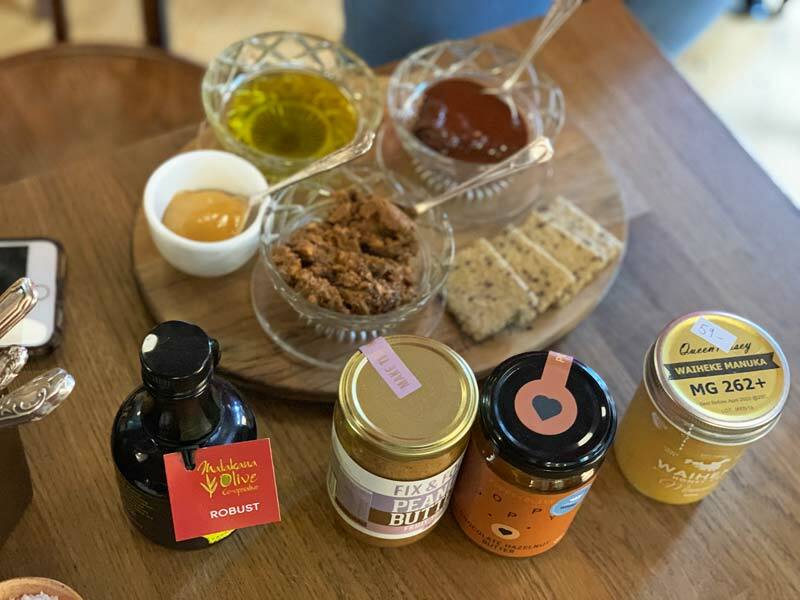 We had the chance to visit and enjoy a bit of a tasting board; smoked duck and fresh bread were memorable treats, but the star of the show was manuka honey. Although it’s hard to quantify definitive Auckland food—food that is characteristic of Auckland or even New Zealand as a whole—manuka honey is a good place to start. Manuka honey comes from bees that feed on manuka trees, and they are found throughout the country. The honey is strictly regulated—not in terms of production, but in terms of the attributes it must possess in order to earn the distinction of being labeled as manuka honey. The honey is thick, rich, and sweet (although not as sweet as the more commercial honeys I have tried). Manuka honey is famous for its antibacterial properties, and it has been used for medicinal purposes as well as a tasty treat. Not all manuka honey is created equal, though, and some stores sell—well, less authentic honey branded as manuka, so it’s important to seek out manuka honey from trusted locations. Scarecrow sells genuine manuka honey, and eating it in the beautiful dining area surrounded by fresh flowers made Scarecrow one of our favorite stops. Our search for a tasty breakfast before a walking tour of Auckland took us to The Store, just around the corner from our hotel. Our visit coincided with the first day of their summer menu, which meant we were treated to inventive meals including ricotta hotcakes with lemon curd. Seasonal flavors were reflected throughout the menu, and our meals provided more food than we could eat. The coffee was equally wonderful- we enjoyed a Flat White and a Long Black during our visit. Although The Store also offers food for takeaway, we were glad to have enough time to enjoy the dining experience. 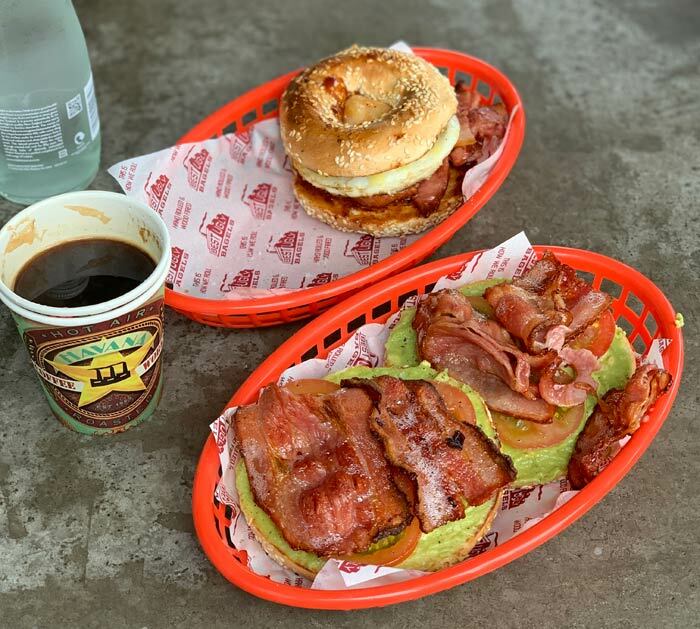 Starting the day with a gourmet breakfast is a great way to start an Auckland food experience! Ice cream is perfected and made into an artform at Giapo, which came highly recommended by every local we talked to during our visit. Forget about walking in to order a chocolate cone that you’ll consume moments later; Giapo reimagines the ice cream experience and reminds you that ice cream is a combination of art, science, and taste—and it can be a way to connect with people. During our visit we were warmly greeted by hosts Sophia and Maddie, whose charisma and enthusiasm pushed an extraordinary experience over the top. We had the chance to sample several ice cream flavors before making our selection, a hard task when presented with a menu full of unique flavor profiles. The hardest decision of all was how we wanted our ice cream to be served to us; sure, you can pick a regular cup or cone, but Giapo offers presentations that range from cones dipped in chocolate to cones boasting their own chocolate frames (perfect for selfies!) to cones adorned with a chocolate squid (yes—an enormous chocolate squid!). I selected creamy coconut chocolate chip served in a specialty cone, a treat so decadent I actually ate every bite. Adam picked “Kiwi as” afghan cookies ice cream baked inside Parāoa Parai, traditional Māori fried bread. The experience was so incredible that we went back a second time, this time using the express lane (“We’re practically locals now!” I told Sophia and Maddie when I saw them through the window). 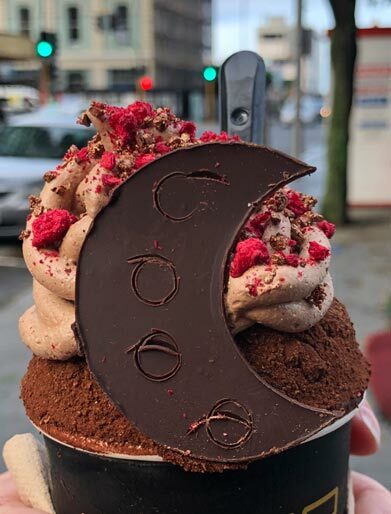 On my second visit I kept my order simple by ordering “just” a cup of Chocolate Evolution ice cream; its presentation was just as impressive as the deluxe cone, a reminder that Giapo is synonymous with high-quality. If you allow yourself just one treat in Auckland, Giapo must be it. 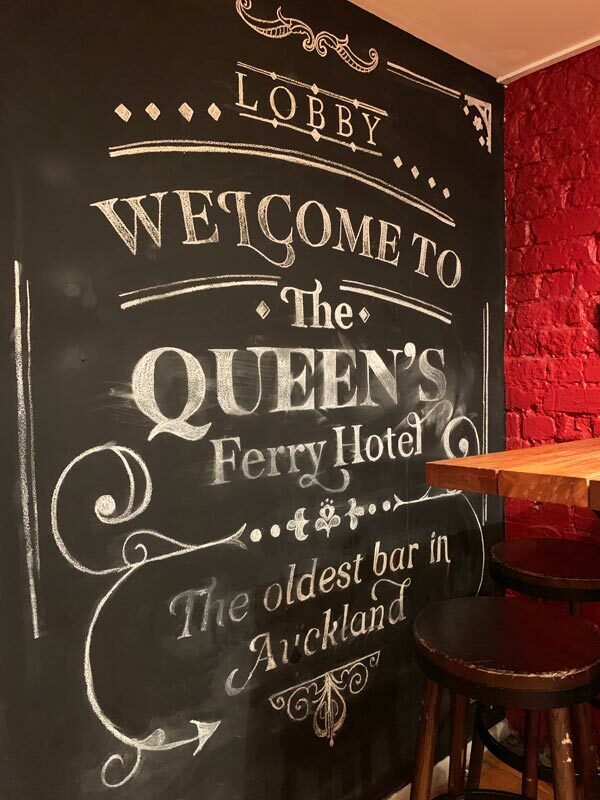 The oldest bar in Auckland is the Lobby Bar and Eatery, a historic spot on Vulcan Lane in the Queen’s Ferry Hotel. Serving brews since 1865, the bar has a long history of catering to some of Auckland’s more unsavory characters; criminals and bookmakers (of the betting and gambling profession) were regulars, as were the journalists who would write about them. In fact, Vulcan Lane was nicknamed Vulture’s Lane to reflect the type of people frequenting the bars there. 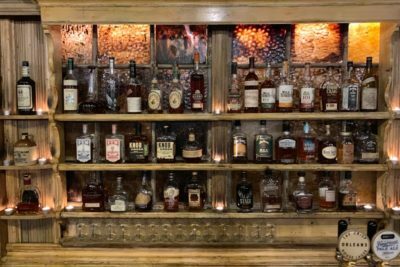 Below the Lobby Bar, an area known as the Gin Room is believed to be haunted. Today, while ghosts and criminals are both rare sightings, the Lobby Bar is a great place to enjoy a pint and even a meal. 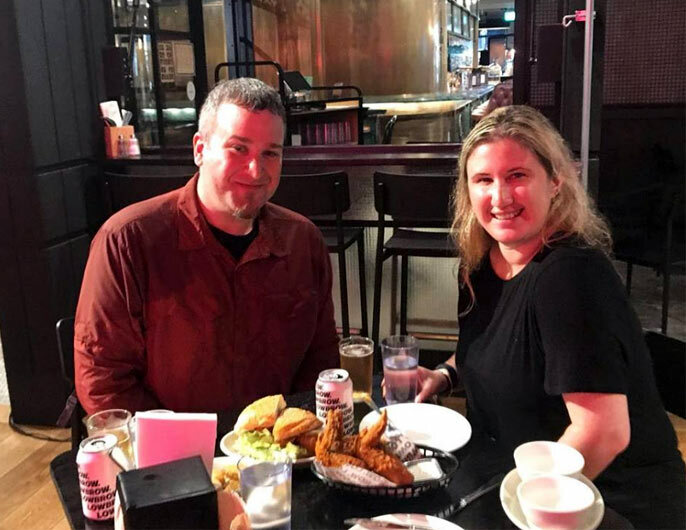 We stopped in just for a round of beers as part of our exploration of Auckland food establishments, and we enjoyed the historical atmosphere. We knew our trip to Auckland would connect us to plenty of Auckland food, but Auckland has a robust coffee scene as well—and Miller’s Coffee is among the best you will find. A boutique coffee roaster, Craig Miller blends beans from Papua New Guinea, Colombia, and Kenya to create a proprietary blend that is full of flavor without a hint of bitterness. Craig’s knowledge of and passion for coffee—great coffee—is clear; his coffee doesn’t hide behind the trends and seasonal offerings that bolster corporate coffee. 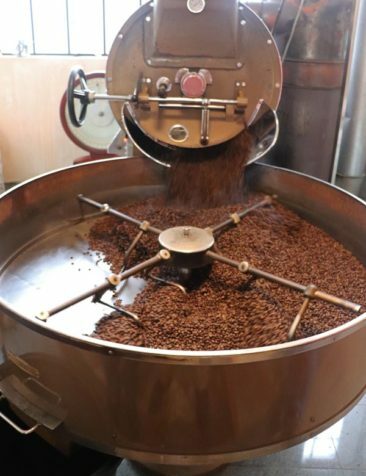 Instead, he roasts coffee beans the same way he has for three decades, producing coffee that proudly stands on its own. We’ve enjoyed coffee in countries around the world, and few come close to being as good as the coffee we savored at Miller’s. 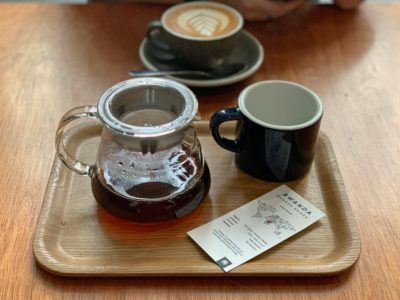 A great place for a quality cup of coffee and a snack, Espresso Workshop has a few locations in Auckland (we frequented the Britomart location during our trip). With a goal of creating interest in coffee, Espresso Workshop does more than just serve it—they also offer classes that teach guests how to prepare a great espresso at home. We only had time to sample the coffee, an enjoyable experience even without a formal coffee education. 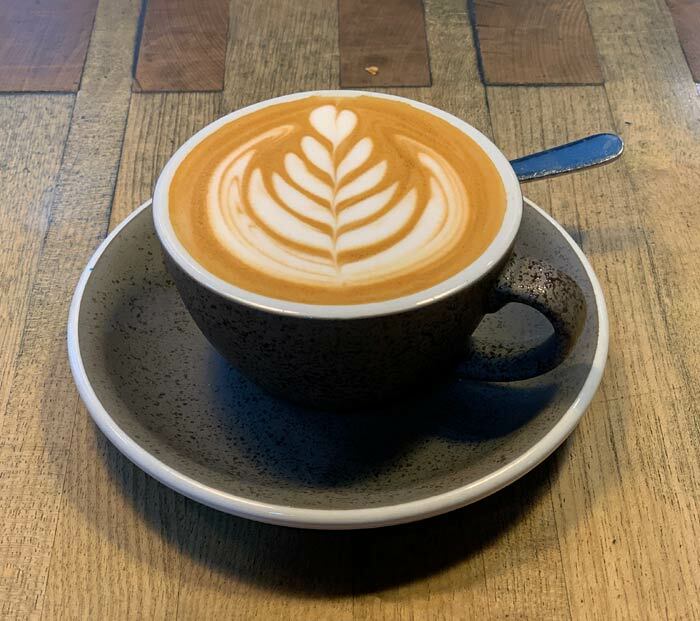 While I ordered a flat white, Adam tried a specialty blend from Rwanda that was truly tasty. 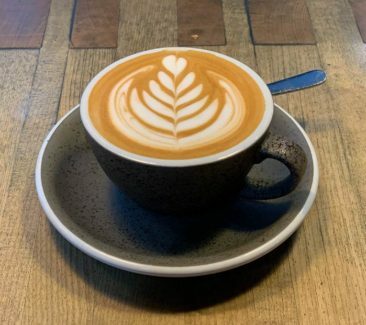 Coffee has emerged as a staple in the Auckland food scene, and Espresso Workshop does a great job positioning quality coffee in the Auckland, New Zealand food landscape. We made the Grand Mercure Auckland Hotel our home base during our visit, and if you are planning to indulge on the city’s culinary delights it may be a great place for you to stay, too. The Mercure is within walking distance of most of the spots we tried, and if you eat as much Auckland food as we did you may appreciate walking between locations just to burn off some calories! The Mercure offered well-sized, clean rooms with comfortable beds and free WiFi—we are planning to stay there again the next time our travels take us to Auckland. We found the best hotel rates on Booking.com; you may find a great deal for the Mercure or another property on Booking.com as well. Here are a few deals to consider. 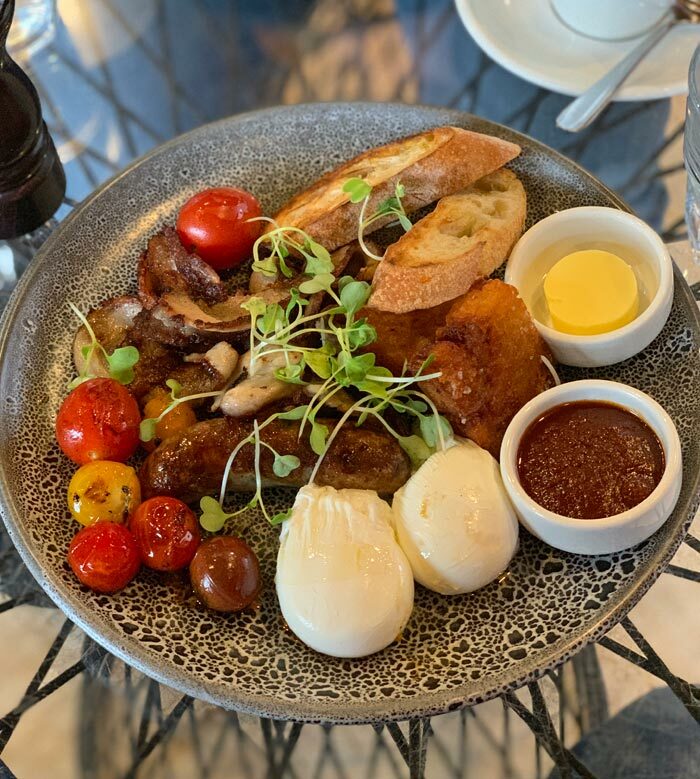 We have eaten memorable meals all over the world, but our visit to Auckland, New Zealand showed us the food scene is as vibrant and delicious as that of any other city we have visited. If you are visiting Auckland you will find no shortage of delicious meals, snacks, and beverages to sustain your sightseeing. 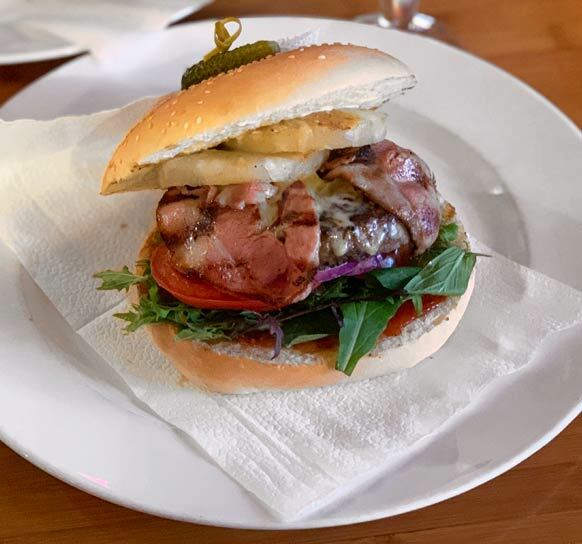 Whether you plan to sample a few dishes in between activities or make food itself the destination with a food tour as we did with Elle and The Big Foody, we know you will be impressed with the Auckland food scene. It truly is the quality that makes Auckland food unique, impressive, and delicious. Giapo Ice Cream Toppings. Try the Chocolate selfie frame. * From time to time, our travels are directly impacted by a service or company. In this case, we visited multiple locations in Auckland on our own and as part of a food tour, and this post includes our candid review of our experience. We selected these locations and companies based on our own research and travel needs; we were not offered and did not receive compensation of any kind from them or any other party in exchange for our review. Learn more about our travel philosophy here.